Can Caffeine Cause Your Arms to Fall Asleep? A cup of coffee first thing in the morning is standard for many people who need a quick pick-me-up. The jolt of caffeine is supposed to make you more alert and clearheaded. However, too much caffeine can be hazardous, and can cause a condition known as paresthesia, or a tingling in the arms or legs, which makes them feel as if they are asleep. From the moment you have that first cup of coffee -- or any caffeinated drink -- several things happen. Stress hormones such as cortisol, aldosterone and testosterone are released by the adrenal glands above your kidneys. These are the same hormones that are released if you feel sudden fear or anxiety. Your muscles tense up, your blood sugar spikes to give you extra energy and your heartbeat and breathing increase, putting your body on full alert. As you take more caffeine into your system, however, your body is at risk of developing vitamin deficiencies, especially vitamin B-12. You may notice when you've been sitting in one position too long that when you get up you feel a tingle underneath your skin, or a prickly sensation followed by multiple little jabs of discomfort. This is known as paresthesia, and is common. The nerves that go through your body relay information back and forth from the brain to the rest of your body. For instance, if you lie on your arm during the night, it might feel numb and unresponsive when you awaken. What has happened is that the nerves and blood vessels running through your arm have been squeezed against the pressure of your weight. All night, your nerves couldn't properly transmit signals to your brain and your blood vessels couldn't bring nutrients and oxygen to the nerves. When you awaken and feel that tingle, those are your nerves trying to send and relay jumbled signals to and from the brain, and your blood trying to move through your arm normally again. Taking too much caffeine can affect the way vitamin B-12 is absorbed into your body. Vitamin B-12 is an essential vitamin for the proper formation of red blood cells, DNA synthesis and neurological functions of the brain. A 2008 study by the American Association for Clinical Chemistry reported that middle-aged men and women who drank too much coffee lost an essential surplus of B vitamins, including B-12. According to the American Academy of Family Physicians, a B-12 deficiency can cause paresthesia, which can affect the way your nerves respond to stimuli and make your arms tingle. 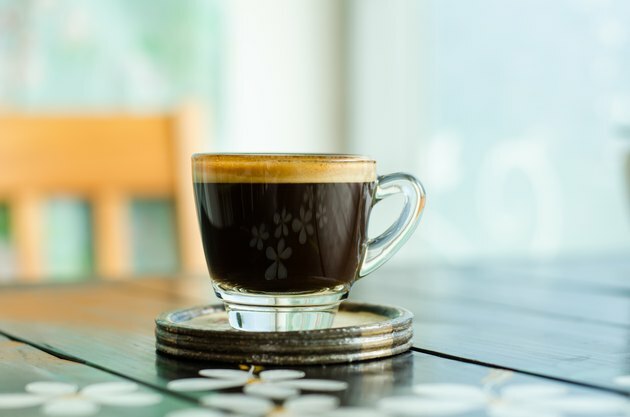 If you regularly drink coffee, soda or other caffeinated beverages and you're experiencing frequent bouts of paresthesia, you could be suffering from a vitamin B-12 deficiency. Many people experience arms, legs and other body parts falling asleep, but if you notice these feelings frequently, check with your doctor to see how you can curb the caffeine craving and add some vitamin B-12 to your diet.